MANTECA - When Constance "Mama Concha" and Rafael "Papa Ralph" Vigallon came to the United States from Spain, they wanted a better life for their young family. 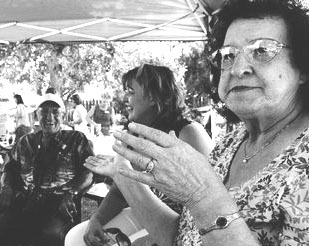 One hundred years later, dozens of their 149 descendants gathered at a reunion in Manteca Saturday and toasted their success. Vigallon descendants from four generations have settled in recent years in Manteca, enjoying more comfortable lives than the couple who brought the family here. "(Mama and Papa Vigallon) came to the agreement they could make something of themselves in America, where they couldn't in Spain," daughter-in-law Dolores Vigallon said. The couple loaded themselves and their infant son, the first of 18 children, on a ship bound for Hawaii. The couple paid their passage by agreeing to work for two years at a plantation there. It was almost two decades later, in 1924, when the family came to California, again seeking opportunity. They found it, though still at a high cost. "It was survival by prune picking," 79-year-old John Vigallon said. Every year for two months the family would move to the "Coyote Hilton," a shack where they would pick prunes - plums picked to be dried. Life the rest of the year was also tough for the family, which lived in San Leandro, and then Fremont. John Vigallon recalled getting up at 3 a.m. for his paper route, then working a couple hours at a bakery, all before the school day. After school he would do chores such as feeding the animals that sustained the Vigallon clan. "Hardworking" is the first description recent generations of Vigallons give their forbearers. As they celebrated Saturday, Vigallon descendants remarked how happy Mama and Papa Vigallon would be to see their children, their children's children, even a great-great-great granddaughter, all together. They would be humbled, descendants said, to see their lives still celebrated. 400 people huh? Maybe some knew that you were coming and decided to stay home. while the turnout wasn't quite what we thought it was going to be, we had 75 FAMILY members there. FAMILY. spouses and the like didn't count. so the count was still pretty high.